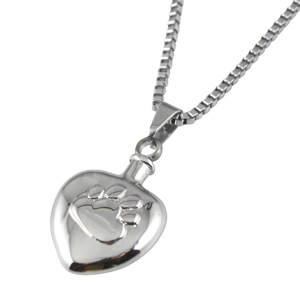 Pet cremation jewellery Chelsea Design 6 is a beautiful and discreet way to keep a token amount of ashes of your beloved pet with you always. 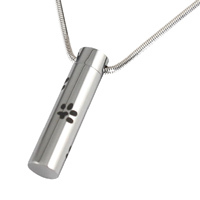 This cremation necklace has a pendant urn which holds a very small portion of a beloved dog or pet's ashes in the neck of the charm. 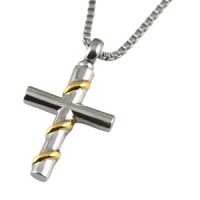 Made of high quality 316L stainless steel on an 18 inch length 2mm snake chain (superior to and not the box chain pictured). 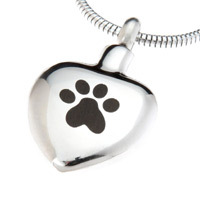 The wonderful heart shaped pendant pet urn is embossed with a paw print. 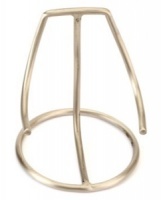 The perfect way to discreetly keep the ashes of a loved pet close to you. Capacity: token amount of ashes or keepsake. 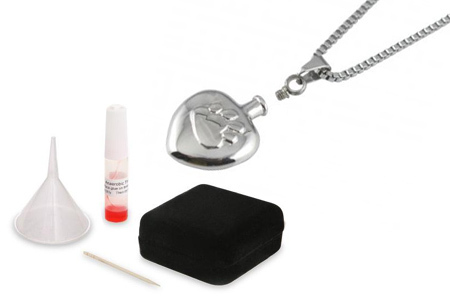 This stylish piece of pet memorial jewellery comes complete with a funnel, sealant and box. 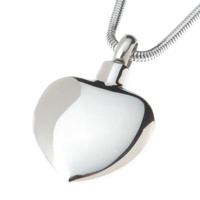 Lovely locket, very good quality and definitely meets expectations. Thank you, I can have Snoopy with me all the time which is lovely, would definitely recommend. My elderly friend had a pet dog which was a Hungarian Puli breed that sadly passed away in January this year. She was looking for a keepsake necklace for her pet's ashes. After days of searching so many websites I asked my friend to have a look on ebay and tell me which one she thought was the nicest. I did find one but it was too expensive for her. 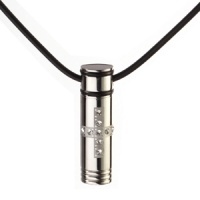 I then found the D for Dog website and after a few phone calls and emails regarding something on the necklace I ordered (Jewellery Necklace Chelsea 6) which was exactly the same design on ebay but better. I decided to buy it for her for her birthday. I ordered it on the Wednesday night and received it on the Friday afternoon and I was able to give it to her birthday which was on the Sunday. When she opened the box she was so happy she cried and that really made me happy to know she really liked it. I was very surprised it was of good quality. It is also good it comes with it's own funnel etc.. as well as coming in a beautiful velvet box. I would highly recommend this particular one as seeing for myself (even though it wasn't for me) was so eye-catching, worth the money and I would even buy it myself if I had lost a pet dog.